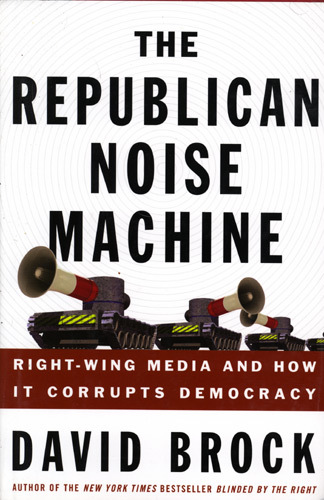 David Brocks THE REPUBLICAN NOISE MACHINE is a fascinating look at the entire media empire of the Right -- FOX News, hate radio, think-tanks, Christian broadcasting, and high-traffic web sites, such as the Drudge report -- to show how a small group of conservative extremists spent hundreds of millions of dollars since the 1970s developing a finely-tuned propaganda vehicle to sway public opinion. Did you know about the Wednesday morning meetings where conservative organizations, right-wing media outlets, and top Bush aides meet to plan strategy and talking points? Or that the Vicks Vaporub fortune was one of the "four sisters" who funded much of the movement? Brock is also the founder of the invaluable Media Matters website, and anyone who appreciates its fine work in monitoring conservative misinformation will find this book essential reading and a valuable reference.